LPA79, Union Pacific's nightly Butler-Sheboygan wayfreight, returns toward Butler southward on the Shoreline Subdivision. This job generally reports for duty at Butler at 1900 Sunday-Thursday, meaning they almost always return to Butler by 0700 Monday-Friday. Last night, however, owing to a meet with a loaded coal train at Belgium, and a fair amount of work en route and at Sheboygan, the job was recrewed at Belgium. That made for an uncommon daylight appearance here in the town of Grafton. This train is big, too: 30 cars, which is at the high end of the typical range. 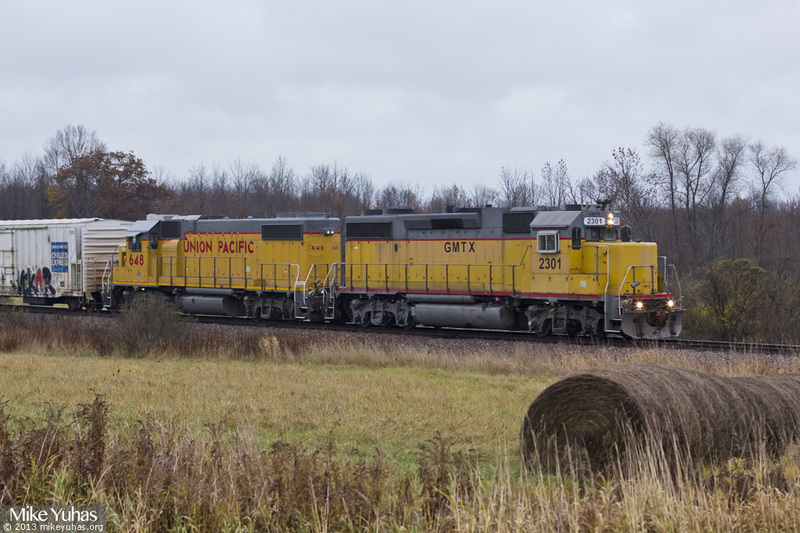 Two GP38-2s handle the swollen consist without issue.